Scope and Content View of the North Bridge and the Old Town, Edinburgh The land between the Old and New Towns was originally occupied by the Nor' Loch, but this was drained in the late 18th century, and the North Bridge was built to span the gap. 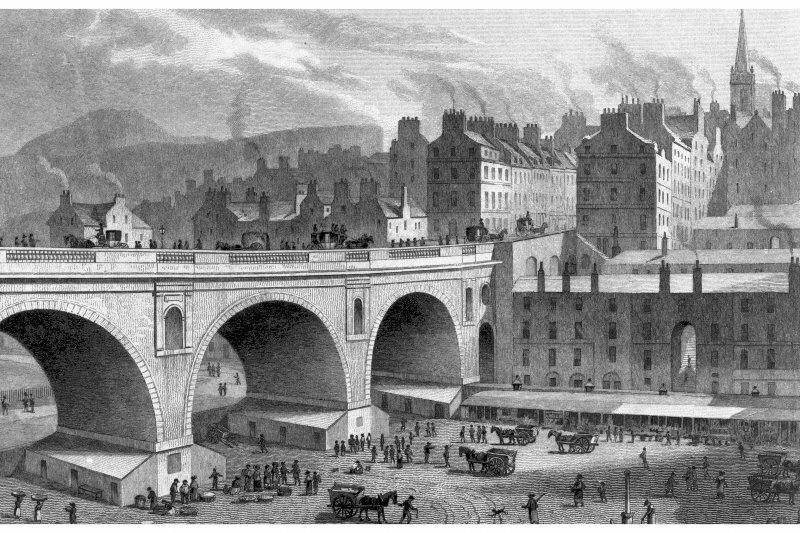 At the time of this illustration the area below the bridge was the site of a thriving market for produce such as fruit and vegetables, as well as fish. Later in the 19th century the Waverley Railway Station was built here. This view gives a good idea of the cramped, dark conditions of the Old Town around the Royal Mile. In the 18th century the city had expanded to the New Town to provide better living conditions for some of its citizens. Source: RCAHMS contribution to SCRAN.